The Buffalo Beauts were looking to become the first to win two Isobel Cup championships in the National Women’s Hockey League. 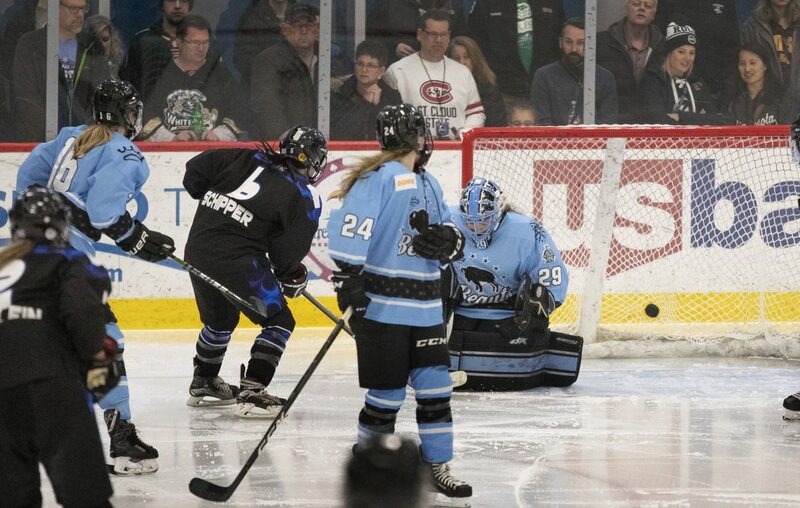 Instead, it was the Minnesota Whitecaps who made history Sunday at TRIA Rink in Saint Paul, Minn.
Minnesota’s Katie McGovern won a faceoff back to Stecklein and the Minnesota defender sired a shot that beat Buffalo goalie Nicole Hensley. Hensley started for the Beauts in place of Shannon Szabados, who did not play because of the the Buffalo team described as a lower body injury. Hensley turned back 28 of the 29 shots she faced before Stecklein’s winner. Amanda Leveille, in goal for Minnesota, made 22 saves. It was the second Isobel Cup victory for Leveille, who was in goal for the Beauts when they won the 2017 championship. The two goals before the overtime tally came in a span of 1:22 of the first period. There were few scoring chances for either side before defender Emily Pfalzer of the Beauts wristed home a shot from the point at 17:01 of the opening frame. Amy Menke tied it for the Whitecaps at 18:23 when she took a pass from Kendall Coyne Schofield and picked the top left corner on a breakaway. Both teams had opportunities to pull ahead in the third, but Leveille and Hensley stood tall. The Whitecaps had a power play late in regulation, but an incredible save from Hensley kept the game even. Leveille matched it with a save late in the period. Stecklein was named the game’s MVP for her winning goal and her work on the defensive end in the game. "This has been a dream of mine and so many on this team to play in Minnesota, so to win this in our first season is pretty incredible," said Stecklein. A native of Roseville, Minn., the 25-year-old Stecklein played as a freshman at the University of Minnesota before representing Team USA in three World Champions and the 2014 and 2018 Winter Olympics. Between Leveille, Stecklein and the rest of the Whitecaps, they succeeded in keeping the NWHL’s two leading scorers, Hayley Scamurra and Maddie Elia off the score sheet. Scamurra and Elia each had three shots on goal. Dani Cameranesi led the Beauts with four shots on. "We knew they were going to forecheck hard, but we play fast and keep things simple," said Elia.